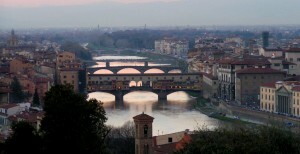 Truly on of the best ways of getting to know a city is via it’s bloggers, and Florence (finally – yahoo!) is no exception. Other people’s opinions, experiences and views are increasingly important and useful to us. We are also learning to read meaning into the words, rather than taking them at face value. If a 20-something US student writes that a certain museum was boring and absolutely to avoid – too many pictures, too much info, too quiet, too many helpful guides ready to give you more information – then your average US traveller, hell-bent on a total culture vacation would probably make a bee-line for exactly that exhibition. One man’s food is another man’s poison! (Or woman, or teenager … obviously). Getting to really know Firenze can require time, patience and understanding! Inside that Texan exterior and accent is a girl that’s embracing her time in Florence with arms and eyes wide open. An extraordinary mix-up of history of art professor, social blogger and wife to an Italian husband; she sees it all from every way possible! Elena lives here, works here, travels on public transport here, dines here and clubs here! If it’s to do, she has probably done it. Kate has lived in Florence since 2011 and has recently converted from blogging about moving here to blogging about living here – that means she has really moved in! These will keep you busy for a while. There are more, but we’ll keep those for posts for another time! Dip into life in Florence through somebody else’s eyes. Have fun! ← How to book a table!